Best wishes for a healthy, happy, and safe end of 2010 and beginning of 2011. New Voices will be back in the new year! As we head into 2011, we're strategizing for the future of New Voices. To help us get a grasp on what you like best about the blog, we're asking you to help us put together a top 2010 list. What was your favorite post this year? What links did you share with all of your friends? We'll use what you've got to make an overall New Voices 2010 in Review list. Thinking about making some resolutions for 2011? Guest blogger Rosemary Benson-Salotti has some advice. Although they have some really cool stuff on their site, you don’t need to check with the National Institute of Standards and Technology to know that New Year’s Day is creeping up, and resolutions are flying around with as much chance of follow-through as Frosty’s vacation in El Azizia. But it is the traditional time to do a self-check, so here’s a question: are you passionate about your job? If you wonder if you’re in the right job, or you’re looking for a new one, do what scientists do: observe. Start by listing what you like about your current situation. Look around. What is it about your job that gets you up in the morning? What could you live without, and which aspects do you dread? How are your strengths put to use? It’s important to take the time to break down the elements of your current job, including the physical environment, communication effectiveness, levels of responsibility, compensation, and opportunity. Merely rating your satisfaction levels in each of these areas will allow you to see where your preferences lie. Then, evaluate your preferences. Are you a good communicator, more comfortable interacting with colleagues regularly, or would you prefer working in solitude? Do you seek opportunities to share your knowledge? If so, would you rather do so in person or by publishing? Are you satisfied working on small segments of a project, or do you need to see an outcome or end product? Experiment: play, "What if?" What if you could do whatever you love and be paid for it? Assume that the position as head taster on Cake Boss is already filled. What would your perfect job look like? Consider the previous categories, and list your Utopian conditions. Then look around. Who has a job like that? Explore your social networks, counterparts at other institutions, and association websites to track down people who do what you’d love to be doing. Don’t underestimate the effectiveness of lurking! Connect with them. Most people are flattered to be asked about their work. See if the functions and features of their jobs converge with your ideals. Once you determine what kind of job will give you the most satisfaction, you’ll be ready to seek out a specific position. Expect the process to take a while, but look at it this way: you don’t need to know about oscillation frequencies to know that time flies. Your ideal job is out there. Resolve to find out what makes you tick. Special thanks to New Voices guest blogger Rosemary Benson-Salotti, consultant at the QUEST Career Exploration Program who has agreed to respond to any questions or comments left in the comments and to make appropriate offline connections. Much of the country, including scientists, benefited from the stimulus plan set forth by President Obama when the economy took a downturn. Biomedical researchers celebrated when this stimulus, the American Recovery and Reinvestment Act of 2009 (ARRA), allotted $10 billion to the National Institutes of Health (NIH), over $8 billion of which went to extramural researchers, creating jobs and supporting innovative research across the country. Research!America has been tracking where the NIH ARRA money went. Every state and most of the US territories received funding for research projects from the NIH. In total, 15,614 projects were funded by ARRA money from the NIH. You can see how your state fared at the Research!America website. California was awarded the most NIH ARRA money, bringing in $1.3 billion for 2,117 projects. Stanford University Medical School alone was able to create or save 45 medical research jobs because of the stimulus. These researchers are able to continue studying a range of important biomedical issues, including cancer, congenital heart disease in children, and the functioning of the immune system. Duke University in North Carolina was able to create or save 166 jobs with the ARRA funding it received. North Carolina ranked sixth in the nation for the $359 million it was awarded in NIH ARRA money. In fact, North Carolina’s fourth district, encompassing Duke University and the University of North Carolina, was the third highest ranked district in the nation, underscoring the excellent research being performed at these universities. Many researchers agree that the stimulus was a much-needed shot of money. Before ARRA, NIH funding had been flat, meaning it wasn't even keeping up with inflation, resulting in only 20% of the grants submitted being awarded money. This low percentage means brilliant ideas go unstudied and young scientists look for jobs elsewhere. These results are detrimental at a time when the country is worrying about its global competitiveness in science. Yes, the stimulus helped, but it was only a temporary fix. The ARRA grants will run out in 2011, creating a huge dropoff in research money. The rate of successful grants could fall to 15%, leaving a glut of scientists who again can’t find money for their research. The NIH must receive more funding to be able to support these scientists. The President is now considering the federal budget for 2012. Urge him to propose $35 billion for the NIH budget because robust investment in science is critical to creating jobs, improving health, encouraging innovation and revitalizing the economy. It's a favorite story to be read in so many households tonight, but this version is for all the science lovers out there. I can't take the credit for this beautiful rendition of Chemistry Christmas by Matt Monroe. (Nor had they the will). And I in my smock. And fell flat on the floor. As our own Papa Chem. Of most X-rays they came. He called each one by name. That same shade of brown. He's a chemist all right! And rose through the air. May your stockrooms stay neat!" For all of those struggling with food allergy this holiday season, here are some tips on gluten-free baking that are also good for those who want to try something new and healthy. Last Wednesday, the U.S. celebrated Bill of Rights Day. For those of you scratching your head, remember that the Bill of Rights consists of the first 10 amendments of the US Constitution. In honor of Bill of Rights Day, I’d like to write about my favorite amendment - the First Amendment. The First provides the basic liberties of freedom of expression, speech, religion, press, assembly, along with the right to petition the government. To Americans, and those living in affluent democratic societies, these rights do seem basic or fundamental even though they are still out of reach for much of the world. So what’s so great about the First? It allows Americans to live without fear of government reprisal, but more importantly, it gives engaged citizens a voice and the power to remake public policy. But this power is only granted to engaged citizens – informed members of society who take the time to vote and advocate. Yes, we are all busy and inundated with the minutia of our lives. How are we supposed to find the time to advocate, vote, and keep up on the issues? There are countless ways to get involved and range in commitment from sending an email to running for office. Those who fail to remain engaged have essentially given up their voice; their Constitutional authority to improve the government. Without engaged citizens, we risk ineffective policy making that could impact any one of our lives. So for those reading this today, I urge you to chose action over indifference and exercise your rights as an engaged citizen. I recently saw the new movie Morning Glory. It reminded me of the stereotype in the broadcast news business that morning news is "soft news." However, it seems to me that the folks on the morning shows have a pretty difficult job of not just distilling the key pieces of evidence to release in a short segment, but also to make it appealing to a mass audience. Those of us looking to become stronger science communicators can learn a lot from how medicine and science news is translated. So for this Tuneage Tuesday, check out this clip from Good Morning America. What can we learn from how this surgical procedure is being explained? A good poem can perfectly capture how the author and the reader are feeling, and then it just speaks to you. Funny or sad, short or epic, poems span the ages. Haiku is a popular Japanese style of poetry that consists of 17 moras, separated into three phrases of 5, 7, and 5 moras. Though not technically correct, English-language haiku are typically written with 17 syllables: 3 stanzas of 5,7, and 5 syllables respectively. 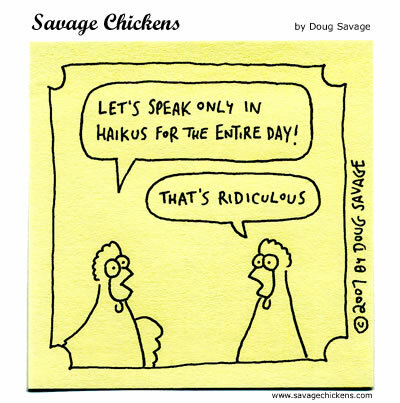 Haiku has become a fun pastime for amateur poets because of its short length and independence from difficult rules, like rhyming or rhythm--a haiku can be easily formulated in a matter of minutes. It's come around again - the birthday of the New Voices for Research blog! We wanted to have a celebratory cake, but digital eating just isn't as fun. Instead, here are some fun facts about New Voices, age 2. Our regular writing team now includes a policy expert, a PhD scientist, and a science outreach specialist. Congratulations and special thanks to everyone who has helped make New Voices a success over the past two years (and before the blog launch). There's no way we'd have made it this far without you! It is the season of perpetual hope. Of giving. Of generously not throwing snowballs at passersby. It's also a time for re-giving. Each of you has a gift. Whether it is being a brilliant researcher, a fantastic mentor, a strategic communicator, a policy wonk, or an issue expert; your gift could be put to good use. When thinking about re-gifting this season, I hope you'll also consider re-gifting your talents in a new and interesting way outside of your professional life. What unique gifts do you have to share this holiday season? Kris: I am a post-doctoral researcher at the NIH in a field called epigenetics. Epigenetics is the study of changes in gene expression that are not caused by changes in the DNA. Oftentimes, gene expression changes when there is a mutation, or a change in the DNA sequence, but there are other signals that can cause changes in gene expression without affecting the DNA. I am particularly interested in the signals that regulate the expression of certain genes related to the patterning of the body. I have developed an innovative system to study these signals in fruit flies. NV: What is the most challenging part of what you do? Kris: Time management. It is sometimes difficult to maintain my productivity while doing all the other things I do, like writing papers and participating in societies. I have to be careful not to bite off more than I can chew. NV: When did you first become interested in science? Kris: As a kid, I was really interested in dinosaurs and I loved pop-up books about human anatomy, space and astronomy. NV: What’s the most common misconception about scientists? Kris: That they are stuffy, antisocial and awkward. Much of what the public thinks about scientists comes from stereotypes seen on TV and in the movies. While some scientists may fit that mold, most scientists would seem like everyday people if you met them at a party or on the street. I am in contact with hundreds, if not thousands, of scientists, and I can tell you that the community is full of smart, well-adjusted, and well-dressed folks! We go out to restaurants, plan social trips to tour DC landmarks, and drink beer in pubs, all without making a geeky scene. Yes, we are regular people who just happen to do research as a job. NV: What advice would you give to someone who wants to get involved in advocacy and/or outreach? Kris: I became very interested in advocacy when I heard The Honorable John Edward Porter speak at the 2008 AAAS Annual Meeting in Boston. He made it clear that strong support for research in the US is crucial for keeping our economy strong into the future, while providing critical benefits to other sectors. He also made it clear that the public and Congress don't understand this, which must be changed. Scientists should be playing a much bigger role here! I always take advantage of any opportunity to explain to non-scientists the value of both basic science and applied research, making sure to explain that many basic research discoveries payoff 5, 10, or even 20 years down the road. I also debunk political attacks on so-called wasteful research projects that may seem to be inconsequential if you only do a quick read of the title. Attacks like the YouCut campaign launched by Eric Cantor just mislead the public, who may not be familiar with the rigorous grant review process and the long-term benefits of research. If you want to become involved in advocacy, find a subject that you can speak about honestly. Get involved with advocacy groups like Research!America-- this is a great place to spend your energy to make a difference. And contact your representatives to let them know what is important to you. Using science and math to make good use of ... actually, I'm not sure this is a good use at all. Why Should Scientists Become Advocates? Tomorrow afternoon I'm giving a presentation on why scientists should become advocates for their own research. As a science outreach specialist, this is a topic near and dear to my heart - and one I'm rather excited to have an opportunity to talk about to a room full of scientists. However, working in this community has taught me that not everyone believes that scientists should advocate. To get prepared for this discussion with a room full of PhDs, I'd love your help. What are your major questions about scientists becoming advocates or science communicators? What is your counter argument (be a devil's advocate if need be!) to scientists becoming involved in advocacy, science policy, or science communication? Thank you in advance for the thought starters and I'll be sure to report back on how the session goes. Digging into the New Voices archives today, we found this great unpublished post by New Voice Takao Yamada written in summer 2009. The question at hand is timely as we head into new-year-resolution-making season. I’m 6’2” tall. I weigh 200 pounds. I exercise 5 times a week for about 45+ minutes. I generally watch what I eat, but I cheat every now and then. All in all I lead a pretty healthy life, but by the standard BMI calculation I need to drop about ten pounds because I’m overweight. But apparently that means that I’m going to live longer. So I got that going for me. A June 2009 study published in the journal Obesity, found that those in the category of overweight showed 17% lower risk of dying that those in the bracket for normal weight. People who were underweight had a 73% higher risk of dying. The study accounted for any of the conflating life style impacts (smoking, age, gender, alcohol, etc.) This comes on top of studies showing that obesity was a protection against tuberculosis and other diseases suggest that what we think of as optimal weight may be incorrect. Before this goes further, let me clarify one important point. I am not talking about obesity. I am not suggesting that obesity is not a serious problem for adults or children. I’m talking about people, like myself, who are active but above their “optimal” weight. It seems likely that some of this is due to the fact that so much of our conception of weight related health is focused on heart problems. Heart attacks and high blood pressure are the concepts we most associate with being overweight, but perhaps in focusing too much on heart health we have lost sight of a more holistic approach to what constitutes a healthy body. It could be that activity level and metabolic health are far better markers in determining what constitutes a normal healthy body. I’m not about to join Health at Every Size or start reading Fatshonista, but I do think it’s worthwhile to consider that we have focused too much on pure BMI without considering whether or not there are other health risks we have conflated with BMI. When we see studies that declare that higher body weights are linked clearly to “all-cause” mortality, maybe it’s an issue of the life style that often surrounds being overweight and not being overweight itself. I'm not saying that obesity is healthy or that we shouldn't focus on healthy life style choices. I'm just suggesting we consider expanding our definition of healthy weight. This may just be an excuse for me to eat the occasional donut, but I still think these questions are worth asking. Have you ever wondered what happens to all the food waste produced by restaurants, supermarkets, and cafeterias? It turns out that these businesses spend billions of dollars every year to dispose of the waste in landfills, where it slowly decomposes and releases methane, a potent greenhouse gas. A new company called ReGenerate wants to change this. ReGenerate is developing a technology that can turn food waste into biogas and a rich fertilizer – on site. In doing so, companies would no longer have to pay for food waste disposal and could use the biogas to generate most of the hot water for their business by connecting it to their existing heating system. The result is a net decrease in greenhouse gas emissions (since the food waste is essentially being recycled) and the creation of valuable commodity (biogas and fertilizer). And by keeping the waste on site, it will no longer take up space in the landfills that have become a point of controversy for communities across the nation. How does this technology work? It relies on the same principles for digestion as a cow. Yes, a cow. Pulped food waste is fed into an anaerobic chamber (without oxygen) where bacteria break down the waste into natural gas (methane) and fertilizer components. ReGenerate affectionately refers to the technology as the Compact Organic Waste System (COWS). The company estimates that the fertilizer components would be picked up once every 20 days and transported to a nearby composting partner for sale to local businesses. The idea and team that drive ReGenerate were formed at the University of Michigan. Believe it or not, the founding members were affiliated with the biogas club and formed a collaboration that was cemented between classes and happy hours. So far, the team has won funding from competitions sponsored by the University and state businesses, which were integral in driving the formation of the company and development of the technology. ReGenerate has developed a business model that takes something with negative value (food waste) as a feedstock and transforms it into a valuable commodity. At the same time, they are reducing greenhouse gas emissions and saving companies money. This is exactly the type of innovative thinking and ingenuity that will be required for the US and the world to address the global environmental challenges that will define our time. We are excited to announce that we have a new blogger for New Voices! Education: Masters in Public Policy and Certificate of Science, Technology and Public Policy from University of Michigan. Bachelors in Biology from Ithaca College. Previous Experience: Max completed his masters internship at the House Committee on Science and Technology, where he conducted research and analysis for the Subcommittee on Research and Science Education. He was also the science assistant in the office of the director at the National Science Foundation, where he provided recommendations for enhancing support for transformative and interdisciplinary research. In addition, he is the editor-in-chief of The Journal of Science Policy and Governance. Look for Max’s first post tomorrow! I wish I had known about programs like this when I was in high school. Definitely spread the word that opportunities like this exist with the young people in your life. Want to know when there is an important health research policy issue? Wish you had a simple way to write to your elected officials and let them know about legislation or budgets or other matters relating to science? Join the Research!America Advocacy Network! It's a simple way to get up-to-date alerts telling you the key information and providing an online form for directing messages to your elected officials. This is NOT a list that will spam you or flood your inbox with messages everyday of the week. When deciding what to send to our networks, we choose only the most critical of issues (this year for example we've sent less than 10 alerts). It's a simple way of engaging in science policy without taking a lot of time or having to track legislation yourself. Sort of makes me wonder if the classic Arsenic and Old Lace is going to be re-done in the style of Pride and Prejudice and Zombies or Sense and Sensibility and Sea Monsters. Your Candidates-Your Health - the award-winning voter education initiative - had more than 400 candidates on the record in 2010 for a total of 170 members of the 112th Congress on the record through Your Candidates-Your Health and its sister initiative, Your Congress-Your Health. To conclude our 2010 Your Candidates-Your Health initiative, Research!America held a post-election analysis last week at the American Association for the Advancement of Science (AAAS) in Washington, DC. Former Congressman and Research!America chair John Edward Porter, and Stacie Propst, PhD, Research!America vice president of science policy and outreach tackled tough questions facing research advocates, including one of the most pressing: what strategies will ensure research remains a funding priority in the 112th Congress? "There’s never been a tougher environment for making research funding a priority. We have to plan how to convince the public and members of Congress that funding for research is a priority," Porter said. In 1995, as chair of the House Appropriations Subcommittee for HHS and other agencies, Porter and leaders from business and science met with then-Speaker Newt Gingrich to spur the NIH budget doubling. An effective strategy Porter says should be applied again. He then proposed several messages for advocacy now: the importance of research to the economy and patients, the importance of maintaining U.S. leadership in science, and the importance of setting priorities for our federal spending. "It will take motivated, committed people in Washington and motivated, committed people at home" to make members of Congress understand that the foundation of America’s economy is science, technology, innovation and research, Porter said. Porter encourages Research!America members to generate messages to Congress from their grassroots networks and scientists to become as vocal as patient-advocates—to reach out to local talk radio and newspaper editorial boards and to meet with their delegation’s district offices about the importance of research funding. To make research for health a priority for the 112th Congress, the community must come together, share ideas, and make their unified voices heard on Capitol Hill. To join Porter and Research!America in this effort, send us your thoughts on messages and strategies for reaching out to Congress and the public in 2011, to advocacy at researchamerica.org. Listen to a podcast from the event and review a PDF of the slides.